I’ve made a rash decision and I’ve done so without discussing it with my husband. I hope he understands but if he doesn’t, it’s really too late. I hope it doesn’t do any permanent damage to our relationship but I feel as though it was a personal decision and I was ready. It’s taken a few years to get here but I feel as though I’ve matured enough now and it’s time. I signed up for the Fruit and Cheese of the Month Club. I’m kind of excited. Fruit of the Month seemed like a really big decision and I couldn’t do it. But then I saw that I could get it with cheese and it was as though the whole world expanded. 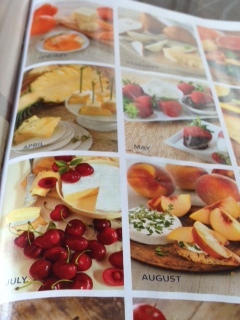 With cheese, Fruit of the Month becomes educational. I figure Harry and David will do all of the work matching what cheese goes best with what fruit and all I have to do is blend the two. By the end of the year, I will know how to eat cheese and fruit TOGETHER. I will keep you updated. I promise to share my new knowledge. Otherwise it would really just be selfish. I hope my husband understands. Does it come cut up and dipped in chocolate too? Here’s to fruit and cheese. With this information you might just rule the world, or at least your neighbourhood. This could totally make me entertainer of the year. I hadn’t thought of that. I promise to use my powers for good. You’re a brave, brave woman. Your children will thank you. I would like you to bring some fruit and cheese to writing weekend. Although…we do have pretty tough fruit laws up here…you may get stopped at the border. PreviousDo Friendships Based on Food Last Follow-UpNextI Am Now Prepared.